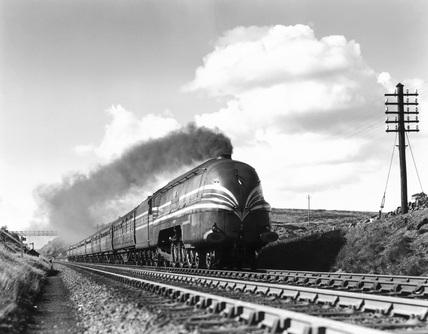 Steam locomotive 'Coronation' with train, Shap Summit, Cumbria, 1937. London, Midland & Scottish Railway Coronation Pacific clas steam locomotive No 6220 'Coronation' climbing toward Shap Summit with a streamlined expres. At 1036 feet (316 metres) Shap Summit is the highest point on the London to Carlisle line. Steam locomotive 'Neil Gow', Ais Gill Viaduct, Settle and Carlisle line, 1960. 'The Royal Scot' steam locomotive, Leeds City Station, mid 1950s. Sheriff Brow viaduct over the River Ribble, c 1950s. Midland Railway steam locomotive, c 1958. Two steam locomotives double-heading a freight train, c 1958. Midland Railway steam locomotive, 1955. WD Clas 8F 2-8-0 steam locomotive, c 1958. Steam locomotive with the northbound 'Waverley Expres', near Keighley, 1962.